The prospect of a lasting peace is attracting more investor interest in the conflict stricken African state of Somalia. The country is largely virgin territory for international investors, but despite the apparent chaos companies like Coca Cola, Turkish Airlines and Africa Oil are all looking into setting up shop in the country which has been ravaged by war for over 20 years. A private equity firm DVK, launched a fund which is apparently backed by royalty from across the Middle East, including from Somalia’s powerful neighbour Saudi Arabia which is just a short hop across the sea. Hoping to take first mover advantage, DVK plans to invest in real estate, aviation and even agriculture, betting on Somalia becoming a food supplier to the Middle East, which faces heavy shortages of water and agricultural land thanks to its arid climate and a rising population. For many in the West and Africa this strategy seems absurd, with Somalia associated with piracy, warlordism, Islamic militancy and is certainly not thought as an investment destination, but for those companies and individuals who dare to enter this market early, the rewards are potentially enormous. Further north in autonomous Somaliland and Puntland, investors are already active, with many firms taking advantage of the peaceful state of these countries, which although not recognised by the UN remain de facto independent. 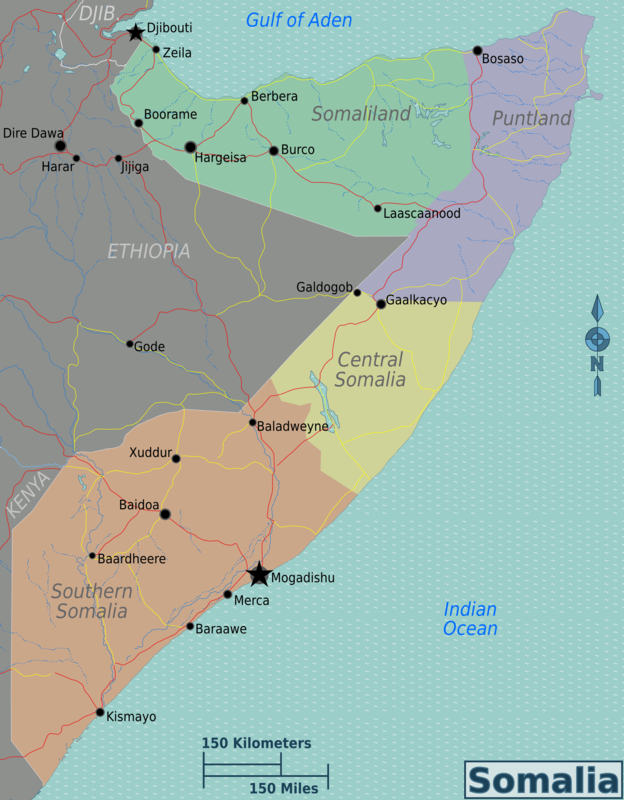 If Somalia does stabilise and enjoy prosperity again, it will be interesting to see if they can reunite the country. The Somali diaspora could be crucial in helping to restore prosperity to the country, clearly years of war and destruction have led many Somalis to move overseas, the number estimated to be around 1 million by the UN. The diaspora can help the reconstruction of the country through remittances to family and friends, and in time by returning to Somalia with skills, education and cash all gained abroad, which combined with their local connections creates an ideal investment catalyst to help kickstart the economy. Somalia’s return to prosperity is of course dependent on it returning to a peaceful state, the country remains fragile and continues to host militant Islamic groups, tonnes of small arms as well as an embattled, poverty and famine stricken population. All of these factors are more than enough to continue the conflict. In many ways the country has very little going for it, apart from the prospect of moving from civil war to a fragile peace and its excellent geographic position close to the Arabian peninsula, jutting into the Indian Ocean. However just moving to a peaceful state can massively boost economic activity and Somalia’s lack of central government has given it some advantages such as extremely cheap mobile phone tariffs compared to other African countries. Other countries have been more proactive in encouraging peace in recent years. Turkey has taken a key role in the process; the Turkish President visited Mogadishu in 2011 and reopened the embassy, drawing praise from Somali community, who see the prosperous Islamic democracy as a model to emulate. The UK has played a role hosting a couple of conferences aimed at building on the peace process, however it is neighbours like Qatar, Dubai and Saudi Arabia who have the funds and interest to cement the peace process with the investment and aid that can bring long term prosperity.